Effort-driven means that when you assign or remove people from a task, Project lengthens or shortens the duration of the task based on the amount of resource units assigned to it, but it doesn't change the total amount of work for the task. When you add or delete resources on an effort-driven task, work is spread around equally among resources. You can turn off the Effort Driven setting if you choose the fixed-duration or fixed-units task type. With the fixed-work task type selected, the Effort Driven setting isn�t only turned on automatically, but in fact it can�t be turned off. If you have a task that requires 32 hours to complete and one resource is working full time on task. This task required to complete in 4 days. 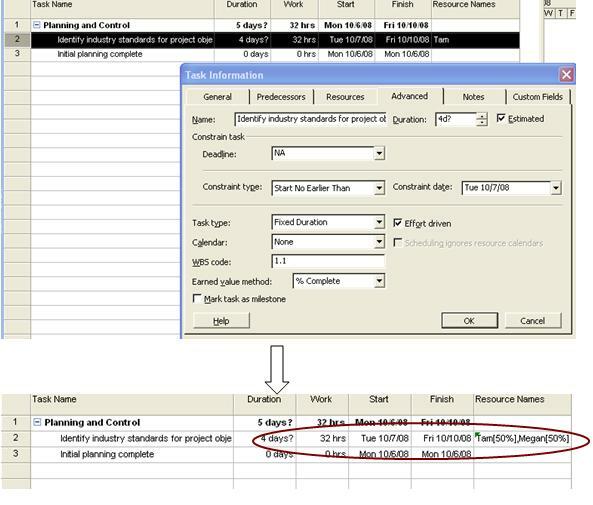 If you assign a second resource and who also works full time on this task; work will be equally distributed between two resources, so now units are showing as 50%. Please note that duration is not altered by adding the second resource.